We distribute the Edwards tennis nets imported from England. This storied company has manufactured tennis equipment since 1884. Edwards nets are used at Wimbledon, the Olympics, and on the profesional tour. 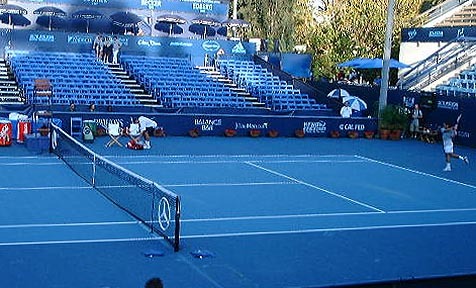 A tennis net is 42' wide and 3'6" tall on the sides. Once installed, a net should be 3'3" tall in the middle before a center strap is installed - 3' after the strap pulls the net down. Edwards nets come with a 47' cable - you may have to cut off the loop or shorten the cable depending on what types of posts you have. An Edwards 30ls net installed on a home court. 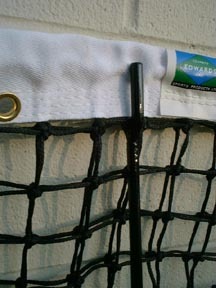 An Edwards 40 LS tennis net installed on Edwards classic black posts with netsticks. Note the double netting for the top five squares. This is at UCLA during the LA Open with Rios working out and making lots of noise! The Mercedes logos on the net is NOT included with an order! #2001 EDWARDS #30LS TENNIS NET: Continually specified for major tournaments worldwide, the 30LS features a heavy duty 34 oz. headband sewn with four rows of Dacron thread. The net body withstands the heavy usage of competitive and club play and the 3.5mm braided polyethylene twine has been scientifically designed specifically for Edwards. 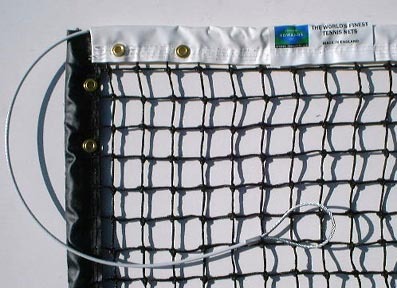 The net is supported by a 5mm PVC-coated aircraft cable and features an extra-heavy-duty bottom tape to resist court abrasion. Thick pockets allow side sticks to be inserted for a professional appearance. The 30LS is the net used at the Olympics, and other major tournaments around the world. It features a three-year limited warranty. #2002 EDWARDS #40LS TENNIS NET : A premier tennis net for the best of courts - the same net used on center court at Wimbledon! The body is the same as the 30LS except with an extra heavy spun polyester headband and five rows of double mesh at the top. It features a five-year limited warranty. This is the best net you can buy. #2041 CENTER NET STRAP: A tennis net strap with a snap for the center of the net - it pulls the net from 39" down to 36" for regulation play. Our strap is a traditional Edwards strap that holds up well outdoors and does not loose a set height. #2043 SINGLES NET STICKS: These sticks are placed 3' outside the singles lines to hold a net at proper height for singles play - a must for tournaments. 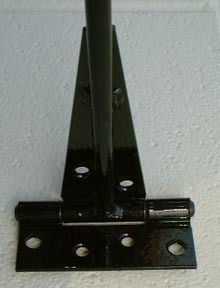 The sticks show are made of metal that has been powder-coated black for long life. The bottom is hinged with a place for bolts to attach to the court for a permanent installation. The deep fork at the top holds the headband in place. 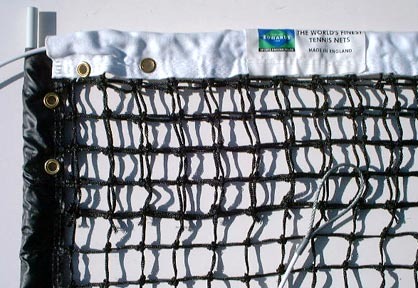 #2007 EDWARDS OUTBACK NET: A net with double netting on the top and extra large dowels. Imported from Taiwan but a pretty good knock-off for those on a budget. #2006 EDWARDS AUSSIE NET: Not shown but the same as the outback except with single netting at the top. Brand name quality for a good price! #2008 MCGREGOR TENNIS NET WITH STRAP: Not an Edwards Net - but a good value. We sell these often to schools on a budget and for people who may not use their courts often. Comes in two lengths - either standard 42' or in a 40' lenght. Prices as of 2/25/2018. Prices subject to change without notice so call to confirm a quote. Many additional items can be supplied but shown is what we always have in stock.